The newly re-launched CashDoctor.com website helps consumers take advantage of these steep discounts available from many hospitals and health professionals for cash-paying patients, and enables them to share this information with their community thereby benefitting others as well. CashDoctor® is a free online health care site that allows consumers to share actual prices paid to health care professionals, rate the professional on the services they received, and search for the best available price and professional for services they need. For the past three decades, the healthcare industry has been controlled by insurance companies, hospitals and doctors. During this time the cost of health care has gone through the roof, and patients are frustrated because there is no correlation between what things cost and what is charged. A recent article in the LA Times reported finding that a local hospital charged a patient $782 for routine blood work. That patient’s insurer quoted an insurance discount price of $415. The cash price from the hospital was $95! CashDoctor® will help to create a real market where doctors and hospitals routinely compete for patients based on price and quality. By providing the consumer with the information required to make informed decisions with their health care dollars, the need for inefficient government run programs such as Obama Care is eliminated. Cash pricing, typically available for hundreds of common outpatient services and tests, can provide real relief to millions of consumers who are burdened by high-deductibles and paying for a greater share of their medical costs. 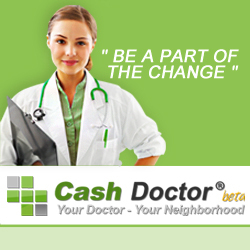 It is the CashDoctor® mission to return health care to the people and make health care secrets not so secret. When users of the CashDoctor.com site input the actual prices paid for procedures performed by specific professionals in their area, they provide the missing link for a real health care revolution to take place. By increasing transparency in healthcare about pricing and patient experience, CashDoctor® will change health care, one community at a time. "This is the solution to rising health care costs," states Rob Stehlin, CashDoctor® Founder. "By empowering consumers and medical professionals with the means to share real cost information, enabling a transparent marketplace, CashDoctor® creates an effective and affordable health care alternative. Big government is not the solution to fixing this crisis. Real cost and quality information is the solution and CashDoctor® provides this. We firmly believe that the time for change is now and that CashDoctor® will play a significant role in improving the affordability and quality of health care." continues Stehlin. To learn more about CashDoctor® and create a free account go to www.CashDoctor.com to become a part of the "Expose Health Care Revolution". The CashDoctor® website is powered by ke and ke Solutions, Inc.
CashDoctor® is a free online health care site that allows consumers to share actual prices paid to health care professionals and at the same time rate the provider as to the services they provided at time of delivery. With consumer driven health care, the patient has the power to not only search for providers, but compare prices allowing them to make informed decisions with their health care dollars. Welcome to the "Expose Health Care Revolution." ke™ Solutions, Inc. (http://www.kesolutions.biz) under the leadership of Mr. Lorin Morar, offers rapid website development and design, ensures optimal content performance with the proprietary ke™ engine website software, as well as custom software solutions and search engine optimization. The ke™ engine is a software package of development solutions designed to allow companies to leverage the web by giving them the power to create, update and maintain their own websites. Empower your company's online presence and stay a leap ahead with ke™ Solutions, Inc.